The isle of Capri is very famous for its particular caverns. One of these is the Blue Grotto: it is 100 metres large and takes its name from the colour of the water in the afternoon. When the sunlight passes through a cavity and shines on the water, it creates a particular blue reflection on the walls of the cavern. At midday, wind and water break on the grotto and visitors can listen a noise similar to a thunder. There are a lot of legends about this cavern, in the past people were certain that in the grotto lived demons and evil spirits. The archaelogists found a lot of Roman sculpures of Neptunes during their studies inside the cavern. The Roman emperors, in particular Tiberius, used to pass their holidays on the isle and the grotto was their private pool. 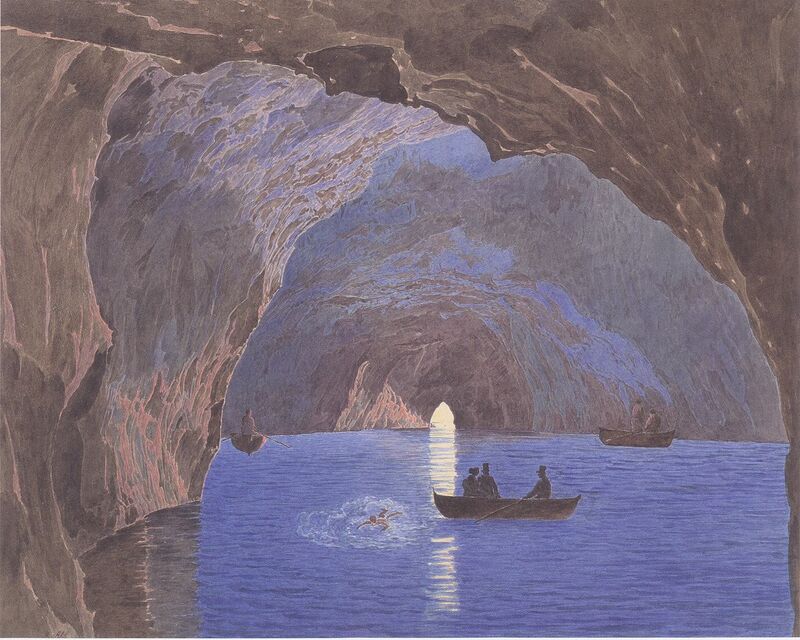 In 1826 the Blue Grotto became famous because it was visited by the German artist August Kipisch thanks to Angelo Ferraro, a sailor of Capri. Grotta: grotto, cavern, cave. A large space in the montains or under the sea. Also called “caverna“. In the prehistory there were the cavemen, that in Italian are called “uomini delle caverne”.